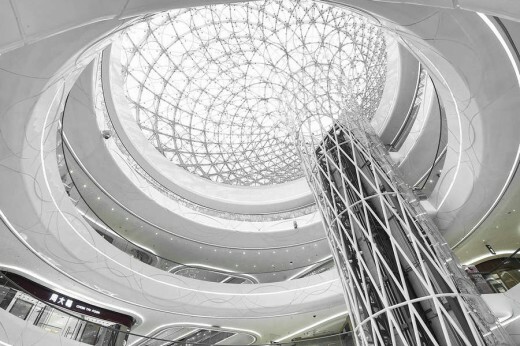 Hanjie Wanda Square is a new luxury shopping plaza located in the Wuhan Central Culture Centre, one of the most important areas of Wuhan City in China. 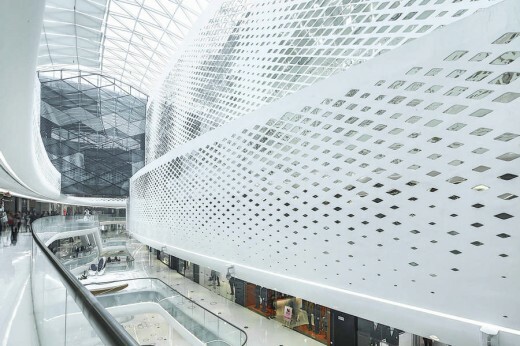 Following a competition in 2011, with design entries from national and international architects, UNStudio’s overall design was selected by Wanda as the winning entry for the facade and interior of the Hanjie Wanda Square. 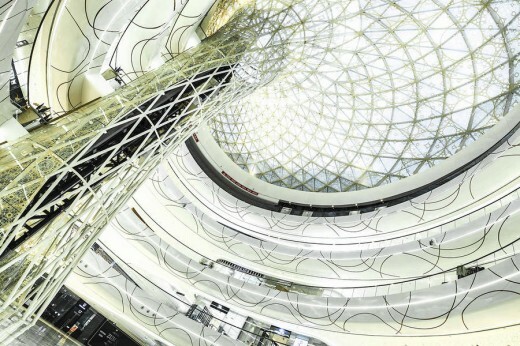 The shopping plaza houses international brand stores, world-class boutiques, catering outlets and cinemas. In UNStudio’s design the concept of luxury is incorporated by means of focussing on the craftsmanship of noble, yet simple materials and combines both contemporary and traditional design elements in one concept. 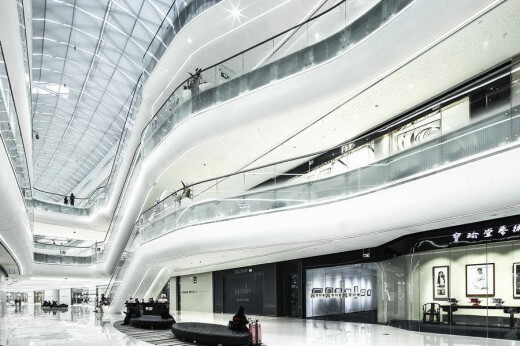 For the design of the Hanjie Wanda Square attention and visitor flows are guided from the main routes towards the facades and entrances of the building. From the three main entrances visitor flows are thereafter guided to two interior atria. 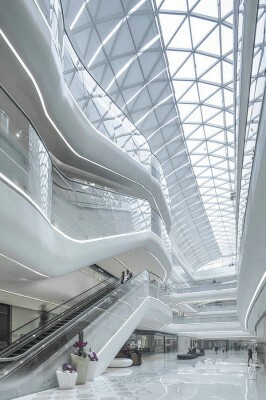 The concept of ‘synergy of flows’ is key to all of the design components; the fluid articulation of the building envelope, the programming of the dynamic façade lighting and its content and the interior pattern language which guides customers from the central atria to the upper levels and throughout the building via linking corridors. The façade design reflects the handcrafted combination of two materials: polished stainless steel and patterned glass. These two materials are crafted into nine differently trimmed, but standardised spheres. Their specific positions in relation to each other recreate the effect of movement and reflection in water, or the sensuous folds of silk fabric. The geometry ranges from full stainless steel spheres to a sequence of gradually trimmed spheres down to a hemisphere, with an inlay of laminated glass with printed foil. The spheres have a diameter of 600mm and are mounted at various distances on the 900 x 900mm brushed aluminium panels, which were preassembled and mounted on site. 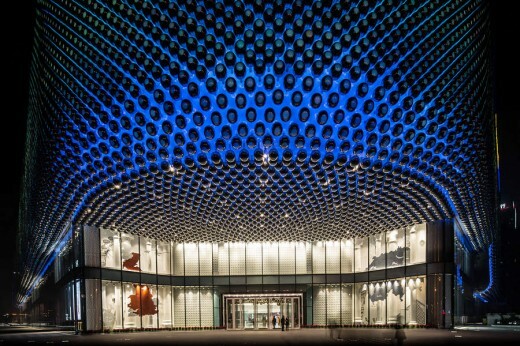 The architectural lighting is integrated into the building envelope’s 42.333 spheres. 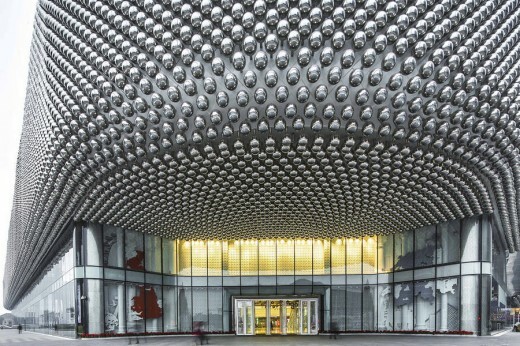 Within each sphere LED-fixtures emit light onto the laminated glass to generate glowing circular spots. Simultaneously a second set of LED’s at the rear side of the spheres create a diffuse illumination on the back panels. A total of 3100000 LED lights where used to cover the 17894 sq.m. media facade. 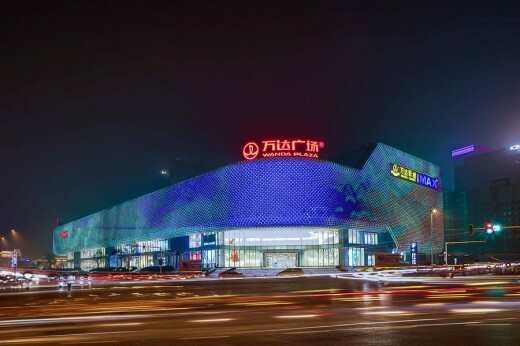 Various possibilities to combine and control these lights allows diverse media lighting effects and programming of lighting sequences related to the use and activation of the Hanjie Wanda Square. 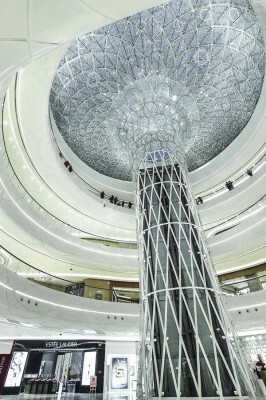 The interior concept is developed around the North and South atria, creating two different, yet integrated atmospheres. 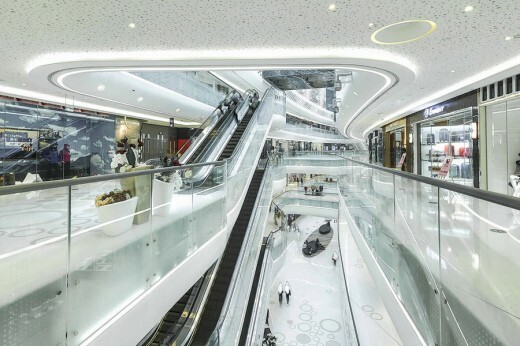 The atria become the centre of the dynamic duality of the two Hanjie Wanda Square identities: Contemporary and Traditional. Variations in geometry, materials and details define these differing characters. With two main entrances, the North atrium is recognised as a main venue hall, and the South atrium as a more intimate venue hall. The North atrium is characterised by warm golden and bronze materials reflecting a cultural, traditional identity. 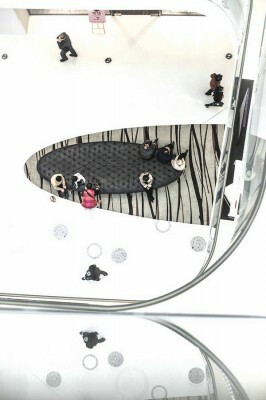 In the South atrium Silver and grey nuances with reflective textures reflect the city identity and its urban rhythm. Both atria are crowned by skylights with a funnel structure which connects the roof and the ground floor. 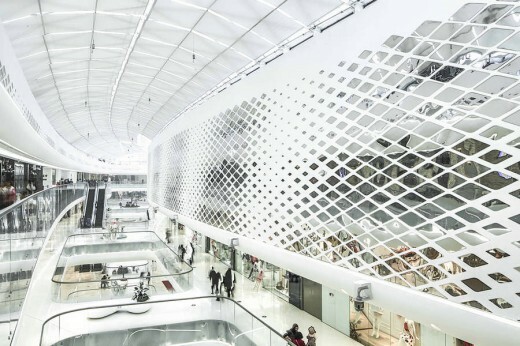 The funnel structures are each clad with 2600 glass panels and are digitally printed with an intricate pattern. In addition, each funnel integrally houses a pair of panorama lifts. 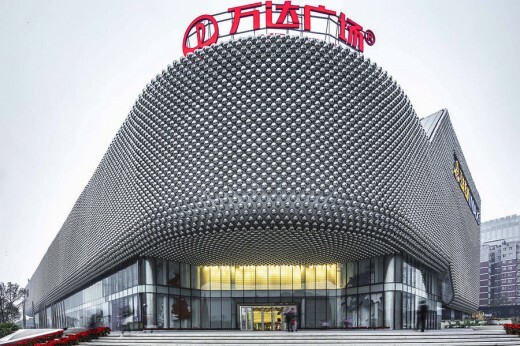 CSADI, Central South Architectural Design Institute, INC.
Beijing JinXinZhuoHong Facade Engineering Company Ltd.
Main structure: China Construction Second Engineering Bureau Ltd.